In my first report on the newly acquired M3, I mentioned that the rod bearings are a known issue on the S65 4.0-litre V8. To recap, because of the engine's characteristics (like that 8,400rpm redline), it needs some pretty special 10W-60 oil. 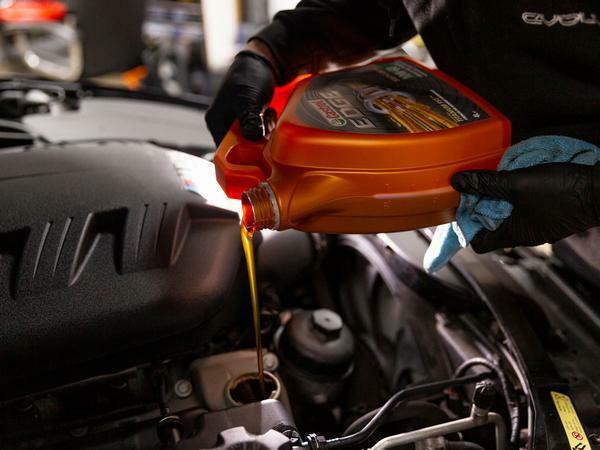 For a frame of reference, that's same oil that you'd find in the in the sump of a Bugatti Veyron. The downside of this oil (aside from it being expensive) is that when cold it is very thick. This, combined with extremely tight tolerances on the rod bearings of the motor, mean that if you rev the car hard from cold, you can do some serious damage. What's worse, this doesn't happen immediately. 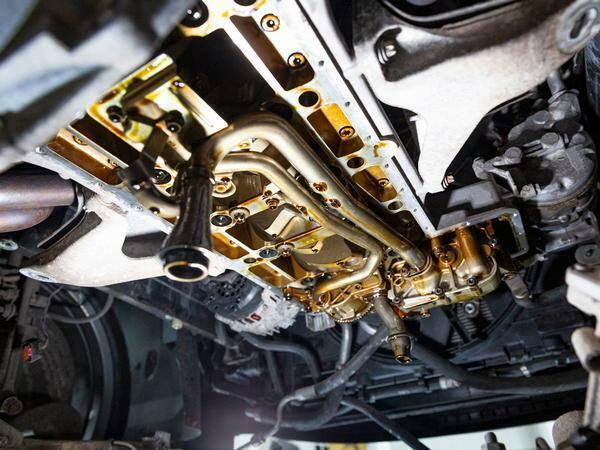 Instead the problem manifests itself much later, the V8 working absolutely perfectly right up until it doesn't, and you find yourself stranded as traffic runs over the oily remains of your recently liberated engine internals. Aside from asking the previous owner if they diligently warmed the car up before making use of that mighty rev limit (which I did), the only way to tell if the bearings might be worn is with an oil sample analysis, although the results of these should also be taken with a pinch of salt. Nonetheless, as mentioned last month I sent away a sample to Millers Oil's lab, the princely sum of £29 seemingly worth it for the peace of mind I'd get from knowing my car wasn't showing any symptoms of rod bearing failure. Or was. In short, the oil analysis showed very high levels of copper and lead in the oil. Copper is what bearings are made of, once the lead outer shell has been worn away at least, the wear more often than not caused by - no prizes for guessing - using 8,000 revs from cold. Brilliant. If you scour the internet for discussions on this subject (and believe me, I have) there are extremely mixed views. On the one hand, the actual number of failures are fairly low so people think you should just get on and enjoy the car and not worry about it. 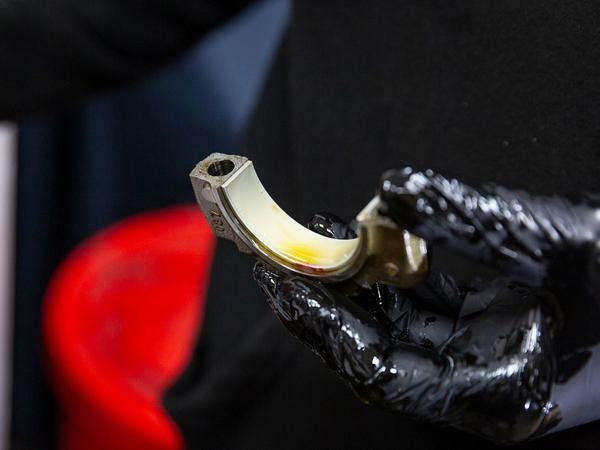 On the other, there is a school of thought that says that for £1,400 you can have the bearings replaced and - as long as you let the car warm up - you'll never have to worry about the motor again, which is very reliable aside from this issue. For me personally, I just couldn't live with the fear of the engine letting go; it was stressing me out and spoiling ownership of the car. 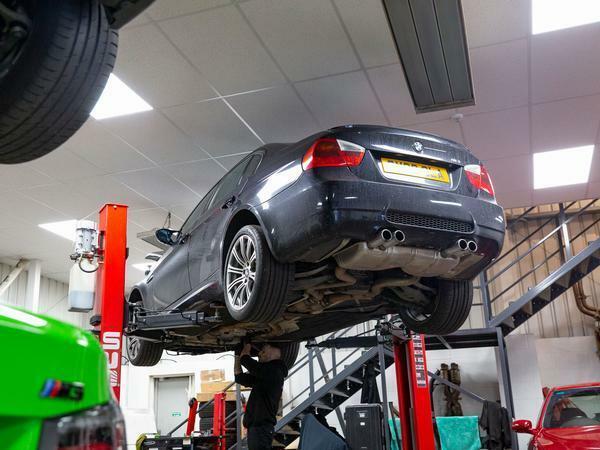 I immediately did some research and got the car booked in at well-known BMW maestros Evolve Automotive for the bearings to be replaced, and whilst I waited for the appointment I introduced a temporary 4,500rpm rev limit, such was my paranoia of catastrophic engine failure. 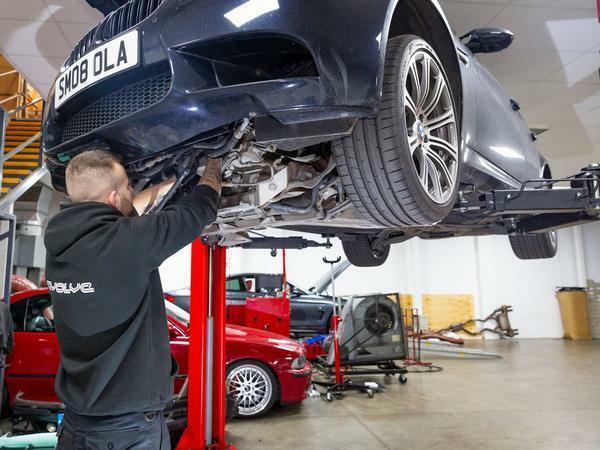 Evolve have replaced hundreds of sets of rod bearings in E90 M3s (and E60 M5s, which suffer the same issue - not surprising given that the engines are very closely related). They also have a reputation for building some absolutely wild McLaren 720S-beating-M5s, so to say they're qualified for the job is somewhat of an understatement. After dropping the car in to them and having a good look around their huge fleet of aforementioned bonkers demonstrator cars, I returned home with bated breath to find out just how accurate that oil sample had been. 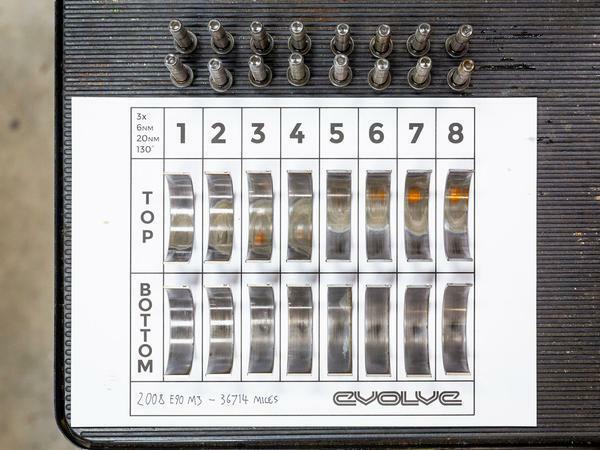 Evolve carried out the work quickly and efficiently, keeping me up to date with how they were progressing as they stripped the engine down and replaced the rod bearings and engine mounts, which are always replaced at the same time as they are nearly as inaccessible as the bearings themselves. Now, in my experience, when someone tells you that something is "not the worst they've ever seen", it usually means that it is, in fact, the worst that they've seen - they're just being polite. And, as you'll see from the pictures, the bearings that came out of the car were, and forgive me for getting technical, more rogered than a policeman's radio. There is obviously no way to tell how long they'd have lasted, but I can tell you with absolutely confidence that my drive home from Evolve (and every drive in the car since) has been absolutely brilliant. Where previously there was stress, now there is only joy, the mix of acceleration and noise at 8,400rpm is something that I can't see myself getting tired of. Right now, it feels like money very well spent. With the car now mechanically fit and healthy (aside from soon needing some new rear brakes), time spent with the M3 has been fantastic. So fantastic, in fact, that I felt like the car deserved some pampering to make it look as good as it drives. I personally really enjoy cleaning cars, but with a young family and a busy life, I never seem to have time to do it 'properly'. Professional help was needed. 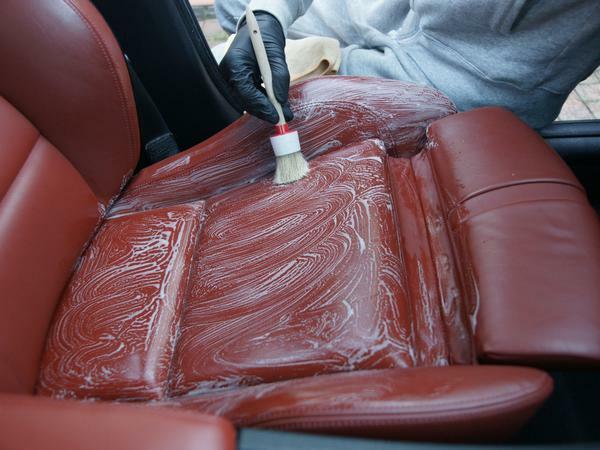 Smart Mobile car detailing are a young business who are completely mobile and offer both one-off detailing, or a regular subscription service to keep customer's cars looking their best. I was a little worried before they were due to arrive as the car was absolutely filthy, but owner and operator, Nick, is clearly one of those people that take great pleasure from getting really dirty cars really, really clean. And I'm not judging him for that! Starting with the obligatory snow foam, Nick got to work the usual process of cleaning every nook and cranny, then using a clay bar, followed by about a million tiny steps and finishing with a polish - the end result looked incredible. Perhaps more surprising was how well the interior came up; after deep cleaning the leather and hoovering the interior to within an inch of its life, the cabin genuinely looked like new. Things like this are so hard to show on camera, but I can't believe that the car looked much better when it rolled out of the dealership for the first time back in 2008. In the end Nick spent over six hours on the car, which for £200 seems like incredible value, especially given how much better a job he has done than I ever could have, and the fact it would have taken me five times longer. Perhaps better still is the 'top up wash' they offer for just £30. 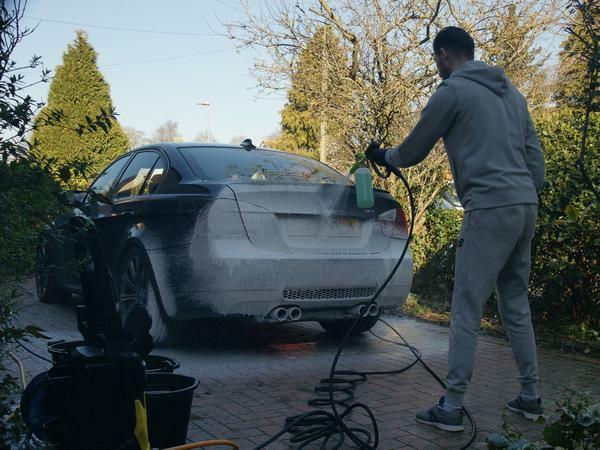 This is a proper, professional wash for the same price as a petrol station 'manned car wash', just without the gravel-laden sponges and from the comfort of your own home or place of work. As the car sits on my driveway now it looks superb, and it is now well and truly ready for some road trips I am planning over the coming weeks. Every time I have an excuse to spend time in the car I jump at it, and to me that is truly the sign of a driver's car. More on that next time. 35k miles and needing integral engine work? Surprised at the condition with those miles, expected the mileage to be more like 70/80k. I bet that's a relief! BMW f ked up with this engine series and used stupidly tight bearing clearances compared to the previous generations. I seem to remember reading it was around half the clearance that's widely accepted in the industry, and used on previous engines. No-one can really explain why except perhaps to wring out a few more hp from the engines... But it leads to this. As noted above it can be exacerbated by revving hard from cold, but it's still a piss poor piece of design. the state of those bearings, very, very wise to rectify that. As far as the 'reliable apart from', I will wager that your throttle bodies will be knackered by 50-60K , so factor those in when looking at things to address. Guess you should budget that money aside when buying one of these for that peace of mind. Least you know its been done now. the state of those bearings, very, very wise to rectify that. As far as the 'reliable apart from', I will wager that your throttle bodies will be knackered by 50-60K , so factor those in when looking at things to address. Fortunately (for me) one bank went just before I bought it, so they have both already been rebuilt and have a lifetime warranty. One thing at a time, but for now I'm just enjoying driving it without living in fear of catastrophic engine failure! Crazy, I REALLY want one of these or prefferably the V10 M6, was hoping that if I buy at around 70k miles then they *should* be ok - apparently not! I guess budgeting the cost of the bearings when buying is the answer. Would oil testing pick up impending failure? Lovely car/Lovely engine.....but these mechanical dramas when the engine is barely run in, is another reason why highly tuned NA engines are slowly being replaced by turbo lumps. Yes, but what's the average lifetime costs of a turbocharged engine, or a twin charged engine, covered in various clever re-circulatory devices to reduce emissions? 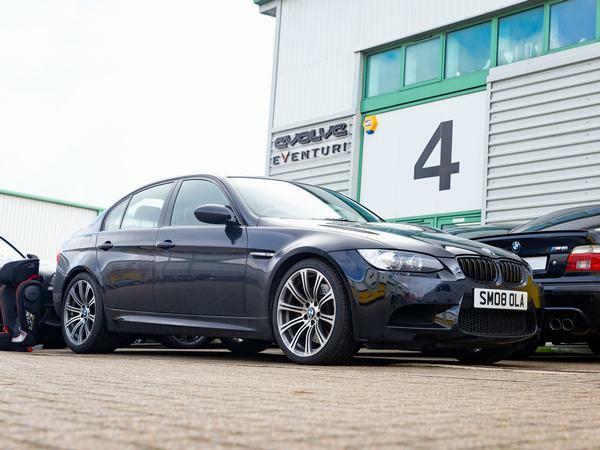 That sort of money is hardly a big deal in the great scheme of E90 M3 ownership. So... no need to run in those rod bearings then, already hammering them on the way home? I know these are every so slightly better to drive but my money would be going on a ISF. So much less to go wrong. The Lexus NA 5L V8 is a lovely thing and pretty much bomb proof. The Lexus NA V8 isn't really highly tuned though is it. Reading this article makes me pretty annoyed. Annoyed because its yet another BMW product with potential catastrophic flaws which affect the engine and also annoyed because on the Jaguar XE thread, people were flaming JLR over their supposed awful reliability. Obviously its a lovely car, but how do the Germans continue to shrug off this sort of story and continue to sell their cars by the bucket-load. If this was a story about a faulty Jag or Alfa we wouldn't hear the end of it. Well they seldom need an engine rebuild at 35k!! It's a valid point, and luckily one I thought of too. Evolve's advice was that the rod bearings do not require the engine to be run in again; you've just got to make sure it is warm before you rev it. Apparently it is not uncommon for them to put a car with brand new rod bearings straight onto their dyno! Having said that, I like to think I have plenty of mechanical sympathy so I did actually complete a few hundred gentle miles to be on the safe side before I started really stretching it's legs - but to be clear Evolve said that this wasn't strictly necessary. I guess the difference is that the BMW is a highly tuned niche performance model where you expect increased care/running costs. The Jag is a run-of-the-mill standard model. £1400 doesn't sound that bad and at least the engine doesnt need to come out. Sort of seems unfair really, first owners of M3's tend not to be quite as diligent as later, enthusiast ones, so they batter it from cold and then some poor sod down the line gets to either get this done, or sweep their engine off the road. Iunno, 12.3:1 compression, 480hp and 96hp per litre vs the BMW's 12.0:1 compression, 414hp and 103 per litre seems like a similar level of tune to me. Likely not, but you enter E90 M3 ownership knowing full well that it's not going to be a cheap car to run. This wasn't an 'engine rebuild' it was the bearings, a known issue, as are the actuators. £1400 for the bearings isn't too bad considering the running costs generally. It shouldn't happen, but it does seem a uniquely German thing to be able to get away with it, presumably because BMW (at least) look after you pretty well if it's an AUC.